When I was younger I always said once I crossed that oh so old threshold of 30, (insert gag face) I’d start to invest in Oil of Olay. Back then, that line of product was touted on the tele as the holy grail for ageing skin. 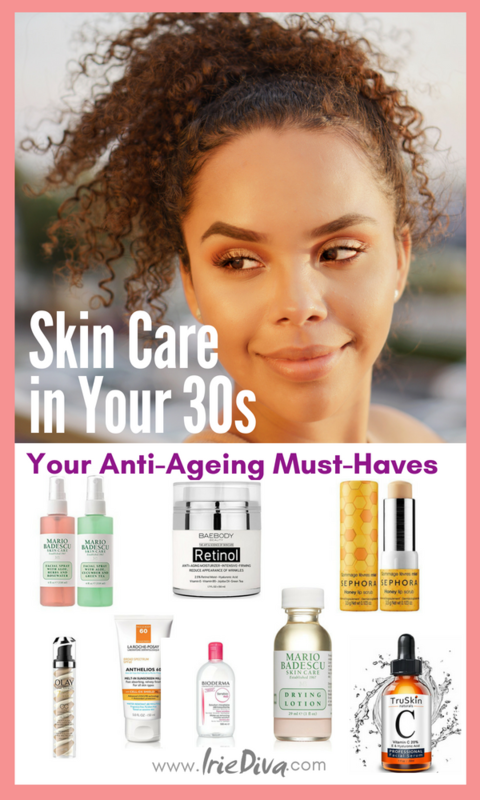 Now that I’m mid-thirties and oh so thankful for youthful skin, I’m going to share the best skin care products for the 30s that every woman needs. It can’t be denied that the older we get, the better we need to take care of our skin. Some drugstore products still come in real clutch like my Cerave facial cleanser. 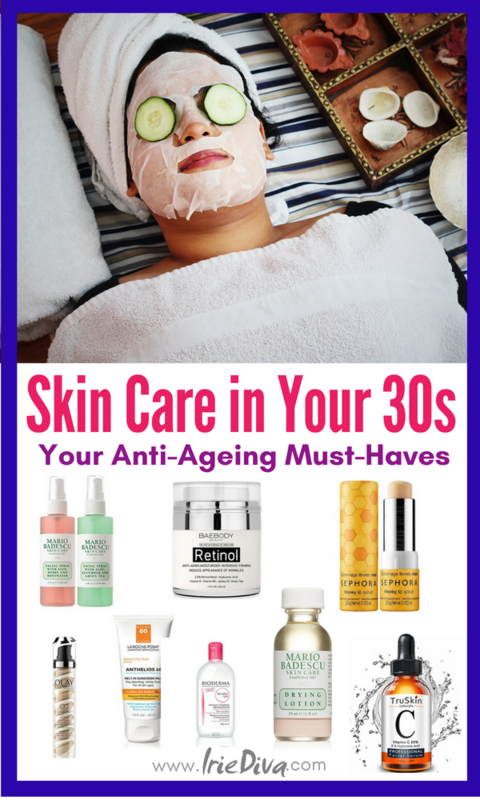 I have added some great serums and other luxury items to my lineup not only for their superior quality but because dammit I’m mid-thirty and I deserve! This face cream is super smooth and hydrating as a moisturizer. I was drawn to it because of the huge buzzword plastered across the front of the label: retinol. Retinol is pretty much Vitamin A which helps to repair and prevent cellular damage. It also helps to prevent damage to these cells to begin with. It will help to keep skin looking young and fresh with wrinkles and fine lines at bay. The packaging is perfect as well since with the pump applicator it keeps the contents air-tight which helps to maintain the quality of the potent ingredients. I’ve thankfully no fine lines yet and want to keep it that way as long as I can so I love this face cream right now. Because I love the face cream so much, I’ve gone ahead and ordered the eye gel in the same line to give it a try. The reviews look promising so we’ll see if it actually works on these baggy undereyes I always had. Mario Badescu products come highly recommended so I thought I’d give their drying lotion a try for my hormonal acne that flares up with my cycle. Why is adult acne still a thing?! Ugh. This product, like most others, doesn’t work for all skin types. It’s awesome for getting rid of pimples overnight though so give it a try if you suffer like I do on occasion. One thing I do love from the line are their facial mists. I’ve tried to make my own rosewater before and got lazy. This one works great as a refresher after a day at the beach in Jamaica’s hot sun. I also use it to set my makeup too, love a double duty product. The green tea one I reserve for my night time face routine. It’s a great finisher after going through a scrub, mask, serum and whatever else may be on my skin care regimen for the night. I’ve finally stopped pulling on my face with baby wipes to remove makeup and switched to using micellar water. I’m not sure how long I thought using baby wipes would have worked with my whole “keeping wrinkles at bay” desires. I usually stick to Simple Micellar Water but wanted to give this Bioderma brand a try for their claims of being formulated for sensitive skin. They claim that their solution mimics your skin’s own biological function. Up your skincare game and give this makeup remover a try. This La Roche-Posay sunscreen got rave reviews in a consumer report for being worth the luxury price. I loved that the formula seems to actually take great care of your skin while blocking harsh sunrays. Though I’m melanated and live in Jamaica so I’m exposed all day every day to the sun, I admit that I’m not as committed to my SPF game. I definitely use a luxurious one though on those days I know I will be exposed longer than a dash to the car or a walk into a supermarket. A good lip scrub is essential for soft smooth lips under your lipstick, especially in the advent of matte colours now popular. This honey lip scrub from Sephora is a gem and I love how it’s easy to apply on the go, if I need to reapply when I’m not home. So one Olay product had to make the list and this colour correcting cream is it. It’s a light tinted moisturizer that will help to smoothen out your skintone with a little SPF protection. It’s an awesome product to keep with you in your purse for those no makeup days. Last on my list of must-have skin care products for over 30 is a good vitamin serum. This TruSkin Vitamin C Serum has a good mix of high-quality vitamin C, E and hyaluronic acid which all helps to keep your skin tight and toned. Here’s a review of another brand serum I love too. What other must-haves have I missed? 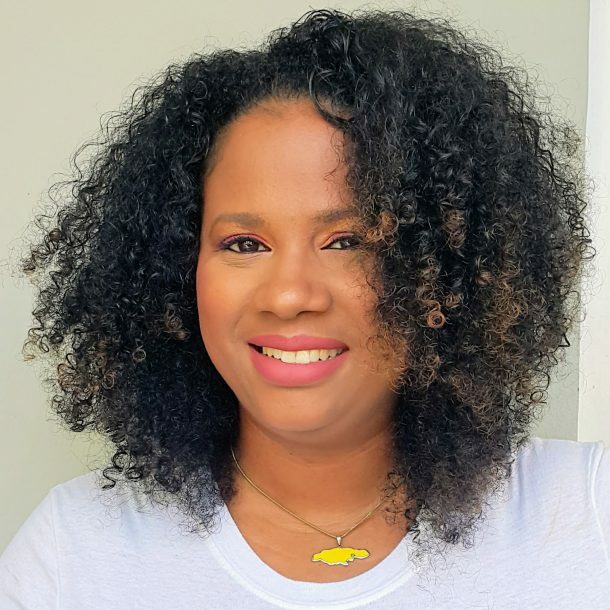 It takes a lot to look this good but luckily with a good regimen, lots of green smoothies and water and some exercise your skin will look its best as you age. Let me know what your favourite skincare product is in the comments below and please share this post with your friends! Thanks for sharing this list. I’ve been looking for new products to try out! I really want to try that facial mist! I’m in my late 20s and all I use are toner, moisturizer, and sunblock. Wanted to know what things I should add to my skincare routine as I approach the next decade. Thank you for these tips! Great list! I would definitely try some of them. Thanks for sharing ♥️ ♥️ By any chance you are interested on doing collaborations, you can check out the collaborations portal of Phlanx.com and connect with amazing brands! I’m not in my thirties but I should still use some these product. I’ve been trying so many products and nothing is working on my face. Really would like to try the vitamin c serum. What a great list.! thats one of my faves from this list! I running out of sunscreen so i’ll be checking out the La Roch posay and I’m a big of the drying lotion for breakouts.